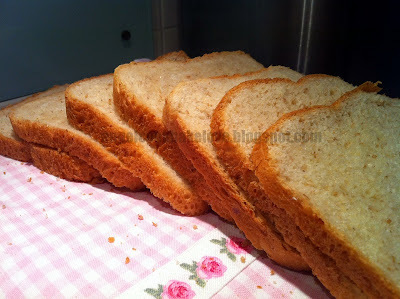 The texture of this bread is soft and fluffy, I am sure I will adapt this recipe again and again for other experiments, it is definitely a keeper to me. 1) Combine (A) and mix well. Add all ingredients in sequence according to your bread machine manual (except butter). Select "Dough" program. Let it knead for about 5 mins until dough is formed, add butter gradually and continue to knead for another 5 mins (total kneading time: 10 mins), stop the program. 2) Select "Basic” program, “Light” colour, “900g” and start the program. 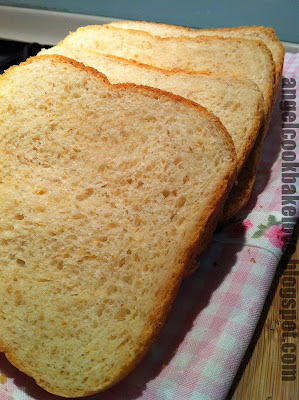 3) Check the bread 20-25 mins before the ending time. Stop the program and remove bread from bread machine once you see the crust is nicely brown to prevent over baking. 1) Si Shen powder consists of Qian Shi, Huai Shan, Lian Zhi and Fu Ling, is a TMC formula that is believed to increase our body immune system and many other benefits. It can be replaced by plain flour or wholemeal flour in this recipe. 2) If you are going to eat with sweet jam you may use salted butter, else use unsalted butter. Alternatively you can use salted butter but cut down the salt to ¾ tsp. 3) You may adjust the ratio of water and milk according to your own preference. 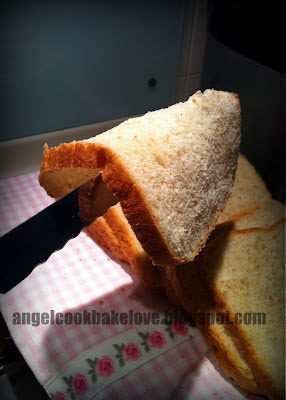 4) When adding the salt and sugar into the loaf pan, they should be placed separately at different corner, never mix them together. 5) When using machine for kneading I like to use cold liquid (and even flour) because this helps to prevent the bread dough to become too warm which is not good for the fermentation. U are welcome! Try this, it is really not bad. 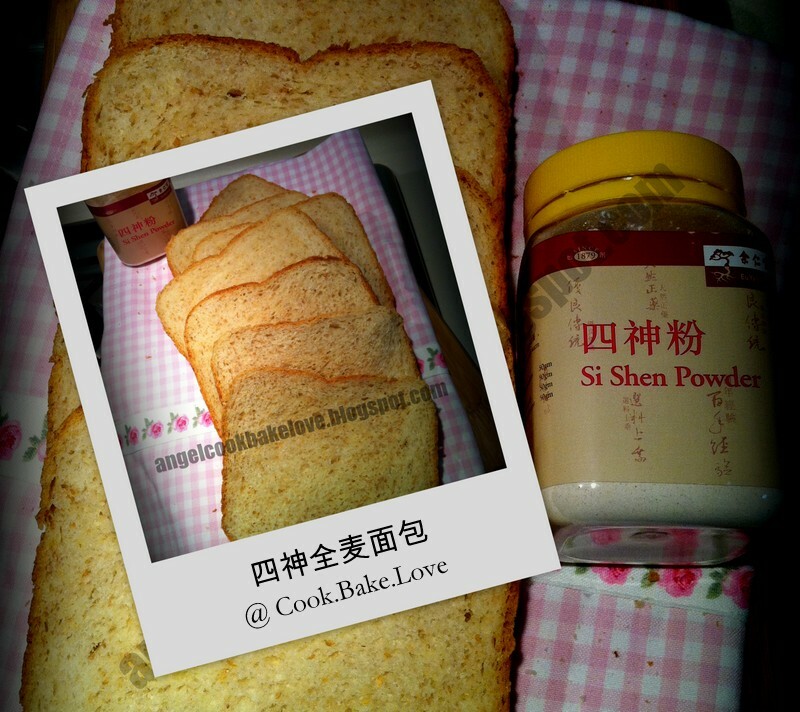 Not nec to use Si Shen powder, u can play around with it. 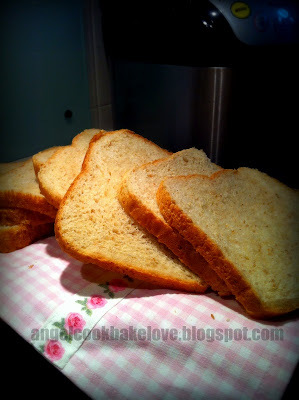 i also bake bread at nite time. I always remove the baked bread from tin & left it in the unplugged oven. It is still soft when i cut it the next morning. Just my sharing. Thanks for sharing the tips to me. Do u close the oven door? Yes i closed the oven door. Thanks for your reply. I will follow your method next time. Please refer to the below link for my BM. This BM has discontinued btw. Hi, can I just substitute with bread flour if I don't wish to add si shen powder in the bread?